LANDING GEAR DESIGN: The standard tricycle gear also allows for excellent forward visibility while taxiing - an important consideration when operating the aircraft in off-airport environments. 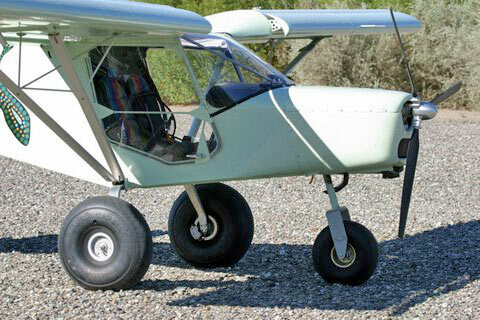 The heavy-duty tricycle gear system was chosen as the standard gear configuration for the STOL CH 701 to meet the needs of todays pilots: Most pilots are not experienced taildragger pilots, and a tricycle gear provides better stability and control on the ground. The STOL CH 701 uses a high tail configuration to allow easy rotation of the aircraft to achieve high lift during take-offs and landings. 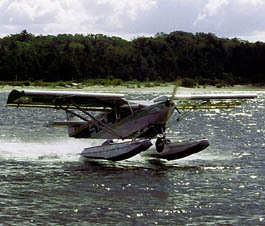 In a tailwheel configuration this requires a tall and awkward main gear to achieve the same high angle of attack (see illustration). Furthermore, the tricycle gear allows for a level cabin area  this makes loading and unloading the aircraft much easier than with an inclined cabin. The STOL CH 701 utilizes a heavy duty gear system developed specifically for off-airport operation. The main gear comprises of a simple single-piece aluminum spring leaf which is bolted to the bottom of the fuselage. The single carry-through main gear provides double cantilever deflection. The main gear is fitted with large treaded tundra tires, with independent hydraulic disk brakes. While its not the lightest gear system around, it provides excellent rough-field capability when combined with large tires, and is very durable, simple and virtually maintenance-free. The main gear is fitted with 8.00 x 6 wheels and 16-inch treaded tundra tires, with independent hydraulic disk brakes. The STOL CH 701's gear has been developed specifically for off-airport use. The direct linkage steerable nosewheel, plus differential braking, provide remarkably precise ground handling and steering. 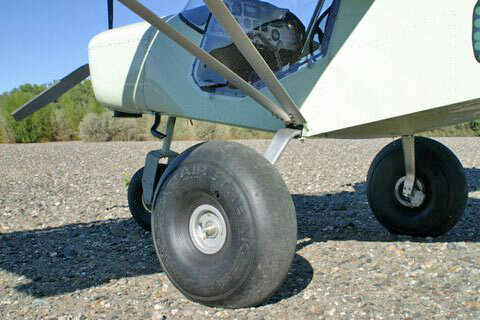 Taildragger Option: While the standard tricycle gear is the recommended gear system, a tailwheel option is also available for the STOL CH 701 for taildragger fans.